The Leadshine ES-MH23480 easy servo motor is a 1,133 oz-in (8.0 N.m) 2-phase NEMA 34 stepper motor with 1,000-line incremental encoder (A , B channels). It is specially designed to be for powered by 110/120 VAC input high voltage easy servo drives . When driven by Leadshine high voltage asy servo drives (closed loop stepper drives), the position loop between ES-MH23480 and the drive is closed. You will never loss of steps, often seen in open loop stepper systems. Because there is no torque resolution needed like in open loop stepper systems, you can much better high-speed performance than open loop stepper systems by increasing up to 30%. Listed below are accessories for Leadshine NEMA 34 Easy Servo Motor (Closed Loop Stepper); 2 Phase; 1,133 Oz-In (8.0Nm) Torque; 1,000-Line Encoder; 0.551'' (14mm) Shaft; 110/120VAC Voltage. 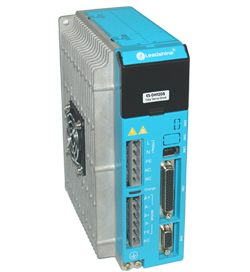 AMT offers the following companion easy servo drive(s) for ES-MH23480, to provide you fully loop closed loop controls. To see all Leadshine easy drives that AMT offers, please click here. The following motor & drive set is frequently bought by our customers in the past to simply their purchasing process and save time. All individual products included in those sets have been fully tested, and implemented by hundreds of OEM industries around the world. Further discounts are also offered for them.